what the Name of God can do. It can purify our mind completely. ‘Papa Ramdas’, as his devotees lovingly called him, was originally named Vittal Rao. He lived between 1884 and 1963 in Kerala, on the west coast of India. He owned a factory, which dyed saris and printed them in fashionable colours and patterns. Vittal was not a skilful businessman and therefore was always indebted, paying salaries to his workers which were too high. When his wife became seriously ill, he prayed intensely for her recovery and she soon got well. This impressed her husband and stimulated his growing interest in finding an authentic spiritual path. -and this was the voice of Ram. ’Sri Ram Jai Ram, Jai Jai Ram’ which was supplemented by Ramdas with ‘Om’ later on. As his love deepened, Ramdas felt the call of God to leave his home and family even though he loved his daughter very much, in order to surrender completely to the guidance of Ram without any means of outer support. He opened three books and immediately found confirmation in the words of Buddha, the sayings of Christ and in the words of Krishna that the impulse to make this great change in the conduct of his life was truly guidance from God. A few days after his departure, Ramdas was led to the great sage Sri Ramana Maharshi and asked him for his blessings. Sri Ramana gazed at him for some moments in blessing. This blessing was what Ramdas later regarded as his awakening. Immediately after having had this darshan, Ramdas went into retreat in a cave on the hillside of Arunachala, where he sang his mantra uninterruptedly for about a month. When he came out of the cave, he experienced for the first time a cosmic vision when Ram revealed himself as all creation. Ramdas embraced trees and shrubs as a manifestation of God. It was such complete dedication to the presence of God in the form of his mantra, which kindled the power of love in him more and more. He cared for lepers, and had no trace of fear either in meeting snakes or a mob of angry Muslims that wanted to kill him. When he met them, smiling like a child, they retreated and made way for him to pass by. Very often his intense joy was contagious to other people and he would walk in joy at great speed, filled with divine power or shakti. He walked through the Himalayas for 500 km, without shoes and with very scanty clothing, often with greater resilience than the local mountaineers. In his books, ‘In the Quest of God’ and ‘In the Vision of God’, his impressive tales are told with great humour and we can get an idea how much strength can be generated through a life of genuine devotion. In 1931 Anandashram was opened near Kanhangad in Kerala. His greatest disciple, Mother Krishnabai, who tells in her autobiography how she found enlightenment under the care and guidance of Ramdas, was the mother of the ashram. They established there orchards and rice-fields and kept cattle; they also opened a primary school and a workshop for apprentices. Later the fields and animals were mostly donated to the workers. 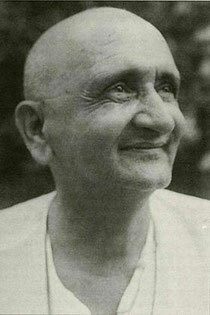 Between 1936 and 1938 and from 1949 to 1957, Ramdas travelled throughout India in order to visit his countless devotees. In 1954 he undertook a world-tour in response to the ardent wishes of many European and American devotees. He travelled with a few companions to Rome, Geneva, Frankfurt, Munich, Paris, as well as to places in Belgium and England. He then travelled on to New York, Los Angeles and Hawaii. The group returned through Asia, taking in Japan, Hong Kong, Thailand, Singapore and Sri Lanka. In his final years, Ramdas suffered from rheumatic pains as well as from diabetes and asthma. In spite of these ailments, he always remained completely childlike - he was a living example of true joy and wisdom resulting from his constant sense of oneness with Ram.